"SECURITY SIGN" indicates a message which, if disregarded, could result in legal action. This security notice sign bears the words "This Area is Under 24 Hour Video Surveillance - Trespassers Will Be Prosecuted". It should serve as a deterrent to trespassers on your business property. Also, you are bound by law to let people know that you are using video. Like most of our signs, this can also be manufactured as a label or an aluminum sign. 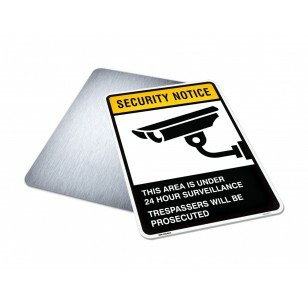 Placement of multiple surveillance signs are a great deterrent for thieves and prove extremely effective. Even if actual cameras are not present, representing a security system is in place by posting security signage is often highly effective in keeping burglars out of, or away from property.